Connect an HDMI Display to a Single Mode Mini DisplayPort video source. The MDP2HD4KSW Mini DisplayPort to HDMI enables you to connect an mDP-equipped computer, such as the MacBook Pro and MacBook Air, to an HDMI display. This adapter is compatible with Mini DisplayPort 1.2 & HDMI 4K @ 30 Hz and as a result can support video resolutions up to Ultra HD (4K) as well as the accompanying digital audio up to 7.1 channel surround sound.With support for Ultra HD (4K) the mDP to HDMI adapter ensures you can convert Mini DisplayPort to HDMI while maintaining an astonishing picture quality four times the resolution of high-definition 1080p. The adapter is also backward compatible with previous DisplayPort revisions 1.0/1.1 with support for resolutions up to 1080p.For a hassle-free setup the Mini DisplayPort to HDMI adapter allows for plug-and-play installation without any additional software or drivers. Plus, with a small footprint and lightweight design, the adapter maximizes portability.To ensure compatibility with any Mini DisplayPort output the mDP adapter offers an active conversion. Active video conversion is required to maintain 4K resolutions when converting Mini DisplayPort to HDMI. An active mDP adapter is also ideal for outputting 1080p resolutions by ensuring compatibility with graphics cards that are not capable of outputting multi-mode DP++ signals (e.g. ATI Eyefinity).To support your Mac the HDMI converter is compatible with Intel Thunderbolt devices that output a DisplayPort video signal.With a sleek uniform white design the MDP2HD4KSW looks great next to your Mac. 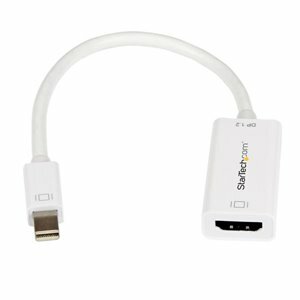 The MDP2HD4KSW Mini DisplayPort to HDMI enables you to connect a mDP-equipped computer, such as the MacBook® Pro and MacBook® Air, to an HDMI display.This adapter is compatible with Mini DisplayPort 1.2 & HDMI 4K @ 30 Hz and as a result can support video resolutions up to Ultra HD (4K) as well as the accompanying digital audio up to 7.1 channel surround sound.